— gave me an even more serious case of shivers. of your companions, shining blackly, eyes afire with corvid cunning. Or, in “Manannan’s Pool” in which Routery describes Cormac’s journey: came he to the fiery water, / Where the salmon crack the purpled nuts of wisdom’s matter. The poems in the final section rival some of the best ecopoetry. “When Birds Are Gods” and “Spring on Mt. Tamalpais” are particular favorites. Even “Queen Califia,” which arguably draws upon Amazonian lore, is a celebration of the fecund, regal animating spirit of California. There are not many books that I want in both print and digital edition. 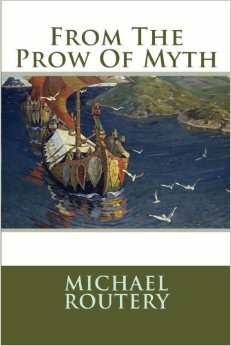 From the Prow of Myth is one such book. Highly recommended to fans of Strange Spirits by H Jeremiah Lewis/Sannion, The Ruin of Beltany Ring by CS MacCath, and fireflies at absolute zero by Erynn Rowan Laurie.